I made some fudge. It was really good. So I’m sharing it with you today. As you may have heard, I’m becoming quite the chocoholic. Typically, I’m the biggest fan ever of dark chocolate. But lately, I’ve grown fond of white chocolate. Those Hershey’s Cookies and Cream Bars, yeah, I LOVE those. My growing love for white chocolate has piqued my creativity. 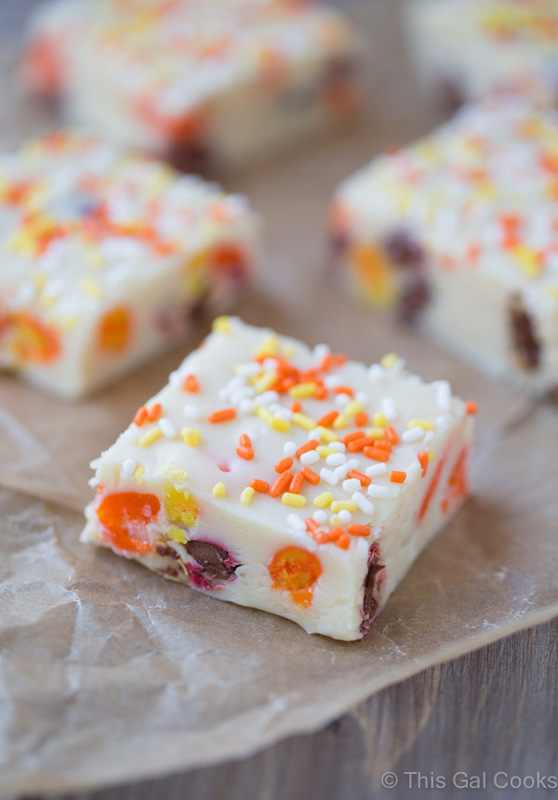 First I made this Candy Corn White Chocolate Halloween Bark. 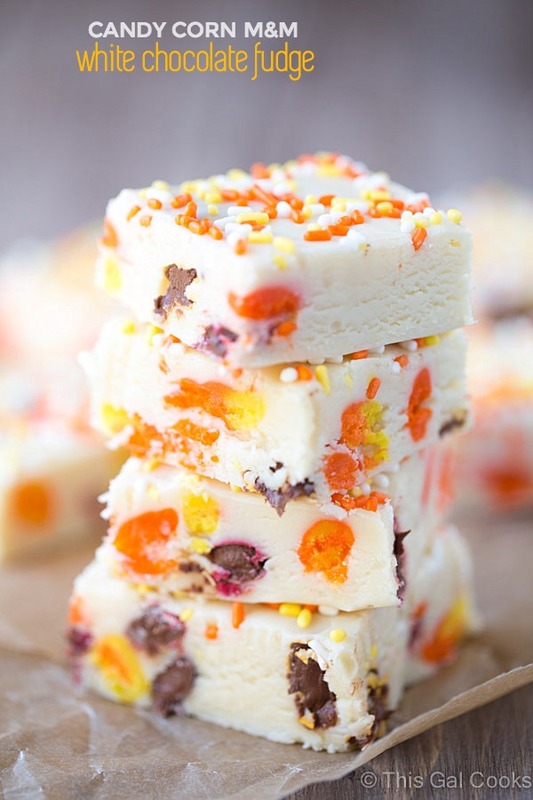 Then I made the Candy Corn M&M White Chocolate Fudge that I’m sharing with you today. 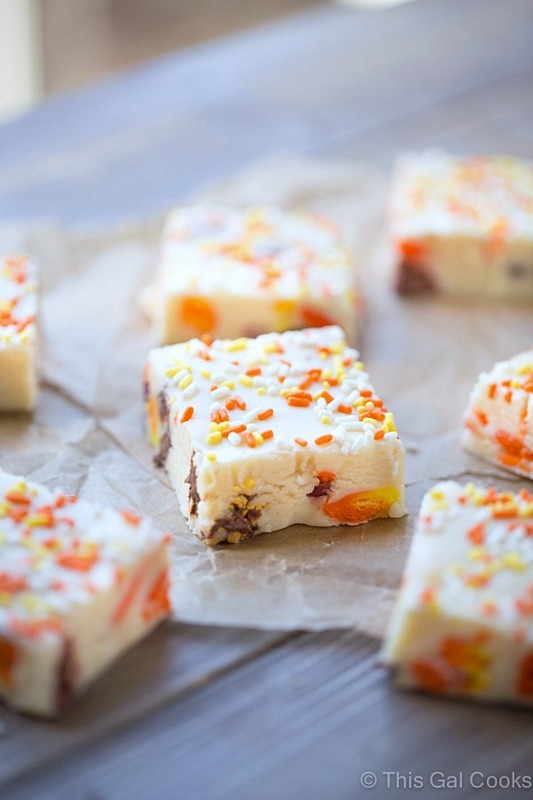 With it being fall, close to Halloween and only a month away from Thanksgiving, I thought it would be fun to make white chocolate fudge with candy corn and fall M&Ms. 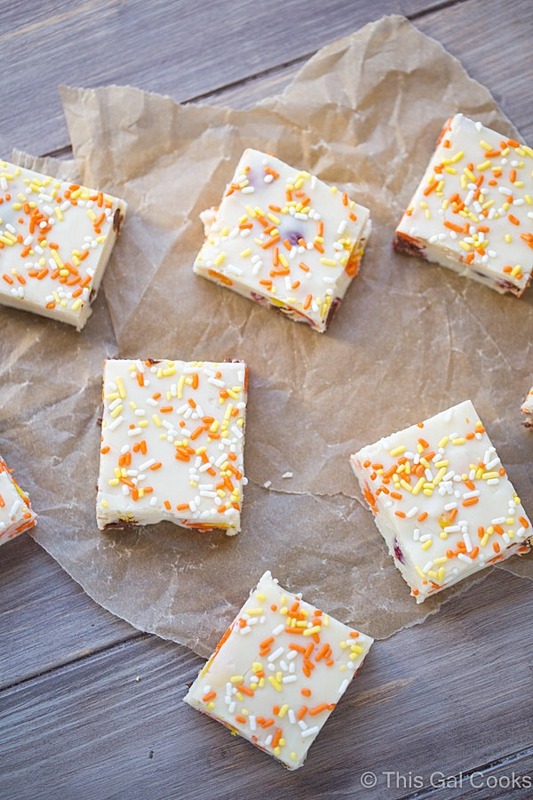 To make it even more fun, I topped this fudge with fall colored SPRINKLES! This fudge is ridiculously easy to make. Heat butter, sweetened condensed milk and white chocolate chips in a sauce pan and stir until melted. Mix in vanilla extract and then the candy corn and M&Ms. BOOM. You have some of the best fudge you’ll ever get your hands on. Someone recently asked me how I don’t weigh 400 lbs, considering all of the food I make. I like to share the love of sweets with friends and co-workers. Today I sent Ken to work with a container of this fudge. I brought a container to work as well. My co-workers love me and hate me for this equally. But it’s ok. For the love of fudge, let’s all enjoy some fudge! Line a 9x9 baking pan with foil, folding the foil over the edges of the pan. Spray with cooking spray. Wipe away excess with a paper towel. In a large sauce pan over low heat, heat the white chocolate chips, butter and sweetened condenses milk. Stir often until melted and easy to stir. Mix in the vanilla extract and then the candy corn and M&Ms. Pour the mixture into the prepared baking pan and smooth if needed (I did not need to smooth mine). Top with sprinkles. Let set at room temperature until set. You can also refrigerate for an hour or two to firm up the fudge faster. Remove from the pan by lifting the edges of the foil. Cut into squares. Number of pieces will depend on how small or large you cut the squares. Adapted from Crazy for Crust. Try these tasty recipes from other great food bloggers. 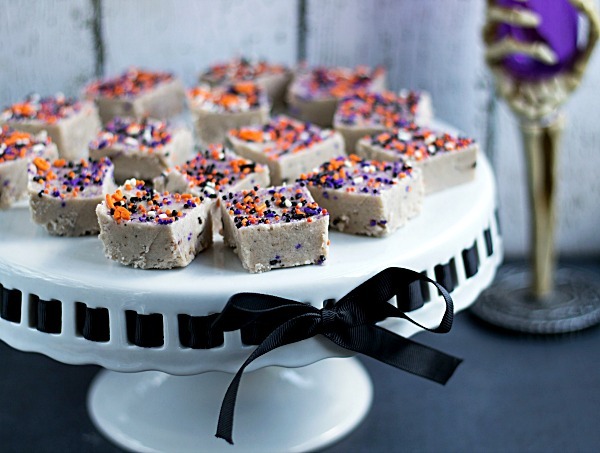 Chocolate Pumpkin Fudge from Spoonful of Flavor. White Chocolate Cranberry Swirl Fudge from Will Cook for Smiles. Cookies and Cream Chocolate Fudge from Call Me PMc. One of my recipes that you may enjoy. This is one fun fudge, Julie! You’re welcome, Zainab! Thank you for stopping by! Ahhhh this is too pretty to eat!! Love love the colors and of course the fact that it’s white chocolate! Thank you, Sarah! Hope you had a good weekend and have a great week, too! I love the colors, fun and delicious! one of my roommates is obsessed with candy corn, i bet if i made this for her she would be so happy! I love white chocolate and it especially looks good in this fudge. It is perfect for fall! Have you seen the Candy Corn Hershey Bars (they’re like the Cookies & Cream, but candy corn)? Definitely need to get my hands on some candy corn so I can create this white choc fudge recipe. It looks so delicious and perfect for Halloween!! I’m into white chocolate lately, too. This look delicious! If I was any good at making fudge, I’d be making it right now! This really is fun fudge! Versatile too, I could mix in anything and be perfectly happy! Beautiful! How fun is this fudge?!?! Love it! OMG Julie this fudge looks absolutely amazing!! Loving those bright and fun colors too :) Pinned! I don’t think I’ve ever seen a more beautiful looking fudge! I love the white chocolate! Pinned! I have literally been thinking about these ALL week, so I ran to the store today to get the ingredients and make this weekend a really good one with these! Except I bought Candy CornM&Ms (like Candy Corn flavored M&Ms, not candy corn and M&Ms). Cannot wait to try these! I could not love this fudge any more than I do!! It’s so pretty and seriously the perfect Fall treat! :) Pinned! Julie. I could not love this fudge anymore! I want to eat it ALL!! Thanks for linking up with Show Stopper Saturday! I almost did eat all of it! But I was nice and shared. :) Thanks for stopping by, Taylor! It will be just as good with M&Ms only! Hope you and your kiddos enjoy the fudge. Have a merry Christmas and a great new year, Lani! Does the fudge freeze well? I’m not sure. I have never frozen fudge.